Most people especially those that buy homes with basements are usually at a loss on how well to utilize the basement space. Basements provide extra space that owners can utilize to their likeness. For instance, a basement can be used as a storage area, kitchen – living area or even a fun and fitness area. Basements are loved by their owners because they are generally quiet and way from the general traffic. As such, most people prefer to use basements for private storage and private living. However, it is possible to create a living space that can act as an extension to your already existing living room for example you can add extra bedroom + bathroom with glass shower doors. Creating a cozy and lush environment in the basement can go a long way to ensure that it is suitable to act as an extension of the main living room. 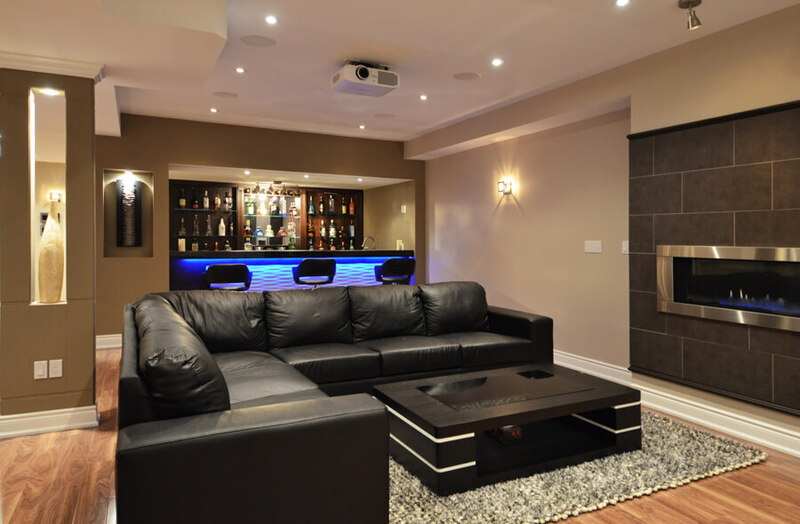 When your basement is fairly small compared to the other rooms in the house and you want to make it a living room, there are some options you can consider. For instance, you can paint the walls white because the color often gives an impression of a large space. You can also choose to use another color on the walls but add extra lighting and use white fabric. All these are effective in making your small basement suitable for a living area. 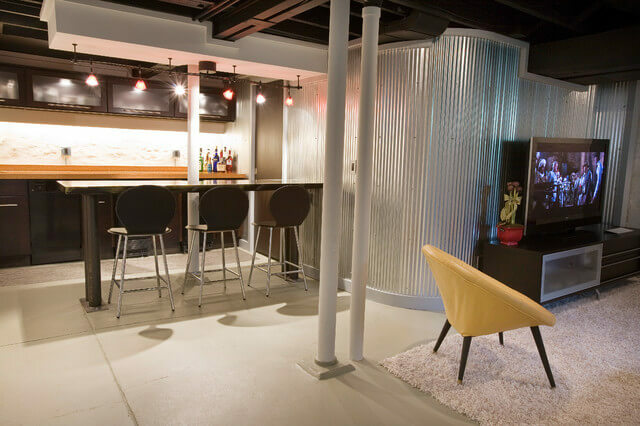 This is a very effective design when you have a basement that is rugged and somewhat filled with hard elements like pipes, metal gates in the ceiling, walls and even on the ground. You can use the right colors to hide these hard elements and add a couch and a shaggy rug. All these factors will ensure that attention is diverted from the hard elements. In addition, these factors could create a beautiful contract with the hard elements in the room to bring out a perfect living room in the basement. You can use this basement design idea when you want the theme of your basement living room to be a contemporary modern house. Colors like white can be use and furniture like book shelves and other wooden pieces can be installed. These will help bring out the modern contemporary theme in the basement. It is important to carefully select the furniture to fit in the space so that it is neither too crowded nor too sparse and scanty. 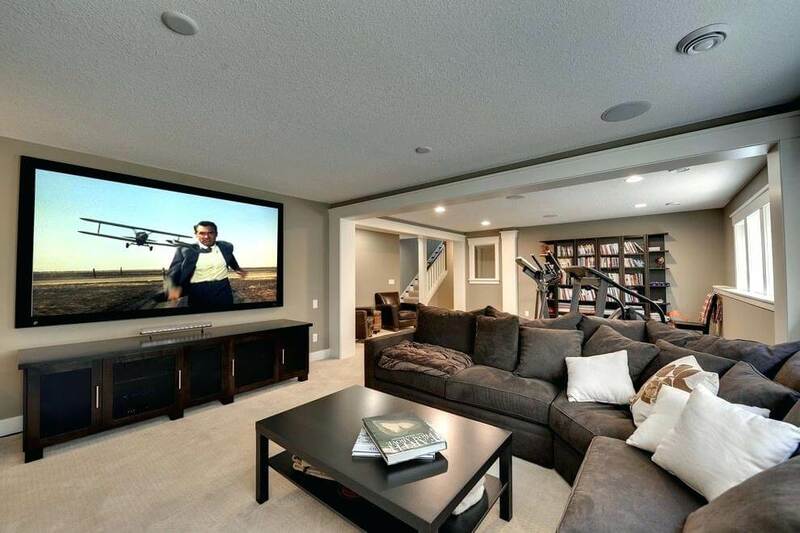 This is a suitable design when you want to make your basement pop. 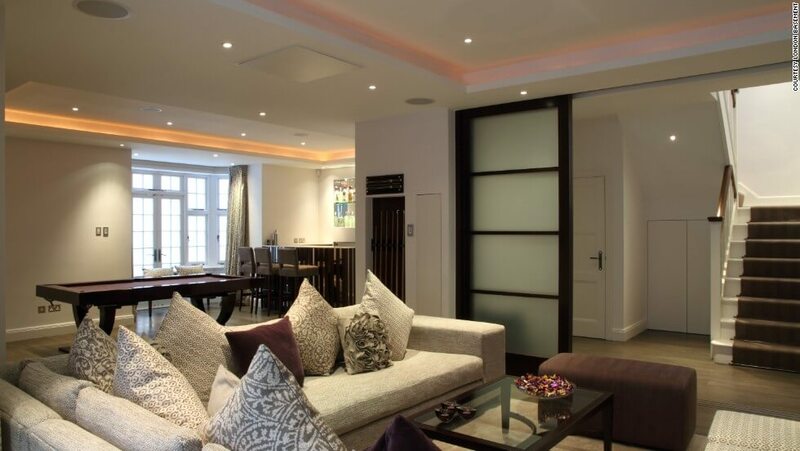 Basements do not have to be all dark and gloomy, especially if they are being used as living rooms. To pull off this look, you have to seek out the colors that will make the room brighter. For example, you can use red and yellow and other bright colors on the fabrics in the room to bring life to the basement. You can also use some indoor plants and modern furniture to make the place look more attractive and alive. As the name suggests, the theme of this room is modern and using modern furniture will greatly. Flat screen televisions, glass and marble tables and LED lights and leather couches are some of the things you can use to bring out the theme. You can also use wall stickers and cool colors to bring out a sense of sophistication and class. Black is one of the colors you cannot go wrong with when you are aiming to pull off this look. 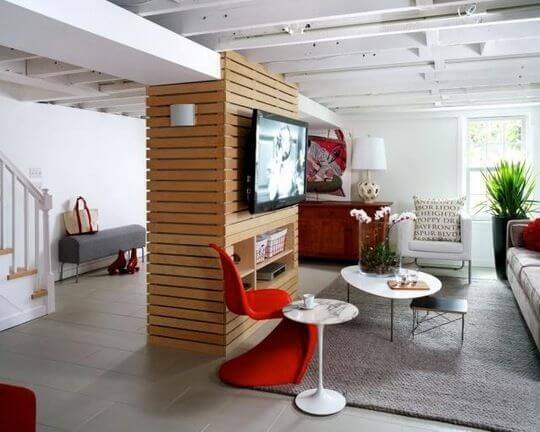 The modern basement look is suitable for the relatively smaller basements so that there is no need for too much furniture to tie the place up together. This is a look that exudes comfort and serenity. A lot of artificial lighting has to be used to brighten up the room. You can also use white and other soft colors to both light up the place and avoid too much contrast. Wall paintings when used should also be in white, cream and other lush colors. The furniture used should be comfortable but simple to give a peaceful vibe to the room. The fabric used in the room should also be simple and soft to further enhance the look. This is the opposite of what the family room should be. Here, it is important to ensure that there is color and diversity in the room. For example, the couches used should have throw-pillows of different colors, a lot of wall paintings and decorations should be included and the design and style should vary. For example, you can use both modern and classic pieces to furnish the room to add variety and a sense of playfulness. In addition to making the place vibrant, these colors and different designs give the room an informal feeling ensuring that the people in the room are comfortable. The basemen should be filled up and furnished with natural and natural-looking materials to give the room a delicate appearance. This is a good look contrary to what many basements are made to appear; hostile. You can use materials like brown leather & brown hardwood flooring and other brown fabrics and furnishings to bring out the natural look. A natural-looking basement is lovely and gives guests and even the residents a calm and welcoming ambience. This ensures that people feel comfortable and at home. Any room, basement or not, has the potential to look attractive and beautiful. However, a lot of work has to be invested in designing the space to make it look beautiful. Designing is not only about the construction, it also involves furnish used for the house and the type and color of fabric used. All the aspects used to make the basement more attractive and functional should ensure that the space does not appear or feel boxed. 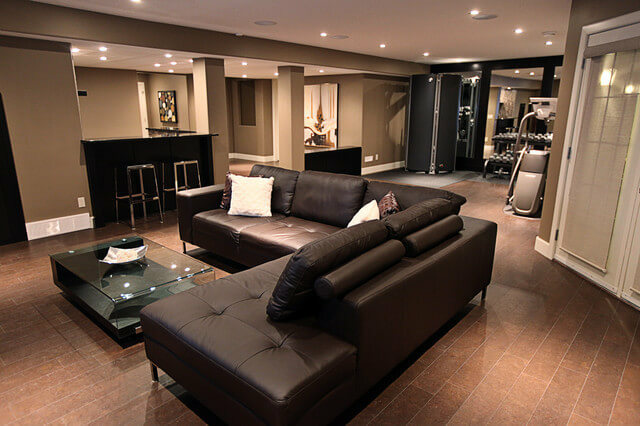 The main aim of designing the basement after all is to make it look livable, comfortable and welcoming. Since most basements are fairly dark, it is important to invest in good artificial lighting and throw in some bright colors to further brighten up the space.